Computer crashes and other difficulties can certainly be caused by a failing or overtaxed power supply, but there are other places to look first. We have a 400w power supply in our 80G computer and lately it crashes and tries to continually restart when I have appliances connected, ie printer, video machine for copying dvd's, speakers etc. I can only run the screen and hard drive at present and the noises coming from the hard drive sound to me like it is really struggling. We have a lot of software loaded and our problems really started when I loaded the last software for my new samsung phone and a new digital camera. I've been to a computer shop and other than costing a small fortune, told me there was nothing wrong with my computer. I've had an electrician in and he's checked everything is okay but asked about the power for the computer. What I would like to know is what would be the best size wattage to upgrade to, ie would 500 or 550 watts be sufficient or try to go bigger. And finally, is this a job easy enough to do ourselves or do we need a computer tech to do it for us. Finding a decent computer tech is not easy! Another problem seems to be turbo lister (ebay software) - when I go into turbo lister that's when I also encounter problems, ie my computer seems to freeze - could this also be related to insufficient power? You've got a lot going on, and unfortunately that means that the answers aren't going to be clear. Yes, it all might be power supply related, but in all honesty that's not where I'd start. I'd start with a concept called "software rot". In a perfect world, we could all add and remove software, add more software, make configuration changes and undo those changes and all would be well. After a while, where "a while" depends on how you use your computer and what kinds of software we're talking about, computers get unstable. It just happens. It shouldn't, but years of experience show that, in practice is just does. It's come to be known as "software rot". Typically, for average users that time is measured in years. In fact, it's often long enough that the computer has been replaced or repaired for some other reason before it really becomes a problem, so you'd never notice. "After a while ... computers get unstable. It just happens." In my case, each of my more heavily used machines lasts about two years before I have to deal with it. Given how you've described your computer and it's age as implied by the 80gig hard drive, it's the first thing that came to mind. In particular, the fact that things seemed to get worse when some software was installed really points to a software, not a hardware, related problem. Back up. Back up your computer. That means making a backup copy of all your data, all the programs, everything. Back it up to an external hard drive, DVDs, CDs or even another computer on a local network, but back it up. Reformat. This erases everything on the hard drive. Typically, it's most easily done as part of the next step. Reinstall Windows. Using your original install CDs, reinstall Windows from scratch. The installation program should offer you the option of reformatting the hard disk prior to installing, which is my suggestion. Update Windows. Windows Update should be the first place you visit. (I highly recommend you get behind a router prior to connecting to the internet, or at a minimum make sure that the Windows firewall is enabled. Restore data. This depends on how you use your computer, but copy off your data files - documents, pictures, what have you - from wherever else they are stored, or copy them from the backup you took in the first step. Yes, this is painful, but it's by far the best way to make sure that you have a clean and healthy system. As I said, I find myself doing it every couple of years. Your timing will most certainly vary. Let's look at some of the other items from the original question. "...crashes and tries to continually restart when I have appliances connected, ie printer, video machine..." this actually points away from the power supply. Most of these types of devices supply their own power; you'll know, because you had to plug them in separately. This actually points more towards software, as in problems caused by the drivers or software attempting to control these devices, even when not actively in use. "... what would be the best size wattage to upgrade to?" I'm not saying that this is, or is not the problem. My initial gut feeling is that the problem is elsewhere, but even so a faulty or dying power supply can also manifest with symptoms similar to what you describe. Exactly what you need depends on exactly what's installed in the computer itself (not connected to, but actually installed inside). If you haven't added any hardware to the computer itself, in all honesty 400 watts could be plenty. However, there's no harm in having more, so when replacing a power supply I typically suggest getting the next step up. 500 watts is good. If you plan to add more hardware (like internal disk drives and the like) feel free to go bigger if you like. "... is this a job easy enough to do ourselves ..." That's a loaded question, because of course I think it's easy for most people to do so, but about that time someone comes along, takes that advice and completely messes it up. So if the thought of opening your computer, disconnecting some plugs, unscrewing the box that is the power supply, and then reversing that process exactly sounds OK to you, then it may well be. If you're comfortable replacing a power outlet or light switch in your home, then I think a power supply is within your reach. But only you can decide if you're "most people". But absolutely, positively - backup your machine first. Could my power supply be causing memory errors? Computer power supplies can fail, and not always in sudden and obvious ways. Failures can be gradual, and can manifest in many different ways. Referring to your advice/answers/suggestions on the topic of "Crashing and the Replacement of Power Supply.....". I have re-installed OS a number of times and mostly follow your list, but I do have a question here. 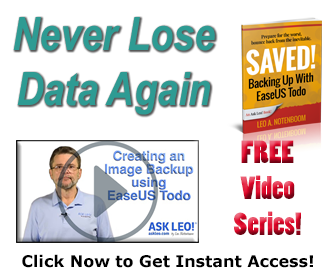 If you are doing a complete back-up (e.g. settings, programs, data, etc) why should you need to install apps from original source? With my last Recovery, I did not restore the complete backup, but only the BU of files and folders overlaying that with a few changed and new files in the time interval just after BU but before Recovery. This leads to my second question; In your topics to do after Recovery you state to copy specific files from the BU. I believe in the program I'm using (A Sonic/Roxio) I'm under the obligation that I can only Restore what was backed-up and can't pick and choose. Am I wrong? If you do a complete, full, backup and restore of everything, then you are correct, you need not reinstall anything. Just remember that if your problem is software, not hardware, related, then the problem may be in your backups as well. I'm not familiar with the backup program you're using, but most allow you to pick and choose individual files from a backed up image. In fact, I wouldn't use a backup program that didn't allow me to do that. It should be noted that the wattage of a power supply can be misleading. Often the �500 watts� or �650� watts is a peak wattage and the PSU is not designed and will not run at the stated wattage. Also, more important is the current rating (as in electrical current- not how it�s rated now!) on the rails, particularly the 12 volt rail. Minimum 18 amps on the 12v rail, better 20+. It starts to get a bit technical, but I would advise getting someone a with some knowledge if you are considering a new power supply. Or �google� �buying a power supply�. There are lots of sites dedicated to the subject. YES!!! it IS the power supply but not necessarily a faulty one. Unfortunately you may have a power supply that DOES NOT put out the rated [ stated ] power. HD's have a habit of struggling with power supply's that are pushing themselves to the limit. If you have several HD's and only ONE falters,[ not just the boot drive ] that can cause a reboot since the system is monitoring all drives and thinks something has failed. I solved this problem [ 12 HD's running ] by connecting another PS outside the box and powering half the drives with it. Problem solved. I started having the same problem earlier this year -- I couldn't plug either my digital camera or my iPod (both USB) without my computer rebooting. If I didn't remove the USB, it would boot only so far before rebooting again. I took it in to MicroCenter and they were thinking it was the motherboard. I asked them to check the power supply, and they plugged in a test power supply. My problems stopped. So they installed a new, more powerful, power supply. No problems since then. Having a similar? problem. My PC with a Soltek MB and P4 CPU began not to boot, no beep. Some times resetting helped plus "load previous settings" in BIOS. Replacing the battery (which was low, 1.13V) plus resetting CMOS by jumper helped for a while, but the troubles kept on. At last no beep at all, no video output. I have been told: MB- or power sply-failure. Trying another power sup. did not help, so I say MB-failure, sounds reasonable? From the beginning the MB has suffered from an unusual behaviour: when turned on, it stopped for a couple of seconds, then woke up and went on. So maybe replacing some capacitors might cure it? Wish some advice before throwing it out. To see if a mother board can be causing a problem that looks as if a power supply is causing the problem. look at the capacitors on the mother board the tops of them should be FLAT and not bulged. if caps are bulged that will cause the mother board to act as if it is not getting required power from the mother board. this is a common problem in older mother boards, replace them.